The year is 1853, a critical year in the lives of several members of the Alcott family. Since 1848 when the family moved from their beloved Hillside home in Concord, the family had lived like gypsies, moving from place to place. Some of these places were dreary basement apartments in poorer sections of the cities, and often during the summers, the family would move into homes of relatives while those same relatives summered somewhere else. All the while Abba was trying to keep the family afloat with her pioneering social work. 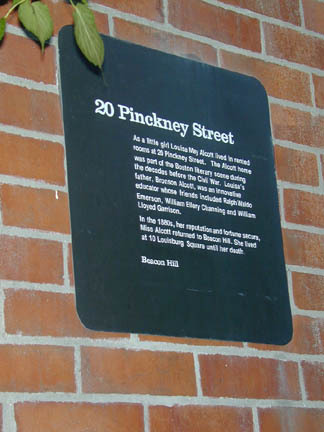 The house at 20 Pinckney Street on Boston’s Beacon Hill is listed in some online sources as having been built in 1860, but it must have been built sometime before 1852, because from 1852 to 1855, it was the home of Bronson Alcott and his family. 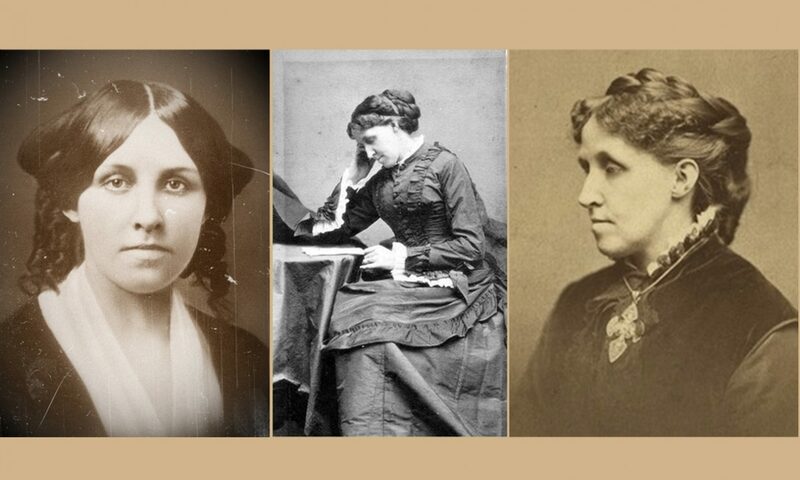 Louisa May Alcott’s room was on the house‘s third floor. While living here, Louisa’s first story was published, “The Rival Painters: a Tale of Rome” in 1852 and her first book, Flower Fables (1854). 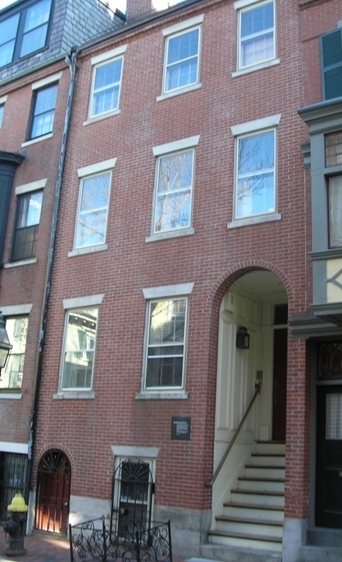 Later, after Louisa May Alcott became a successful writer, she lived in nearby Louisburg Square, looking after her father. When I finally made it to this house, trudging up hills carrying my trusty 2% latte, there was construction going on across the street. The guys working on the house there seemed puzzled at my odd behavior– stopping to take pictures of what, to them, was probably an ordinary house. I took several photos, and stood there and smiled for a few minutes, imagining Louisa stomping about the hills nearby, peering out of the window at me, maybe even waving. The lady who lives nextdoor came out to walk her Golden Lab and asked me, very politely, what I was looking for. I told her, and she smiled, and said the Alcott’s hadn’t lived there very long and were even “evicted.” She told me I ought to go to Concord– and I told her I planned to, but still, this place was important too. I spent the rest of the afternoon wandering around Boston looking at other historic sites– but most of them didn’t draw me the way this one did. Remember this letter from Lizzie, written from this address? This is one pilgrimage I will have to make! Anyone want to come along? I visited a few years ago. It is definitely worth doing! My experience was similar to Ms. West’s, though no one asked me why I was there. I am SO late getting into Boston, it’s ridiculous! I’ll come! I’ve never been out East- I must remedy that! I lived in this house for 5 1/2 years in the 1960s-70s; we had the second (“parlor”) floor. It was nice, solid house with a tiny backyard (about 6′ x 18′). I researched the Alcotts and the house at the time. It was built in 1826. The roof is made of slate from England that came over as ballast on sailing ships. It is not at all a large house, and with a family the size of the Alcotts, I’m sure it was very cozy. It was heated by shallow, coal-burning fireplaces in the 19th Century. The Alcotts had a lot more room at Brook Farm, and in Concord. Emerson and Thereaux used to come over to # 20 to visit Bronson and sit by the fire, as Harvard students, I take it. Bronson was known as the father of American Transcendentalism. 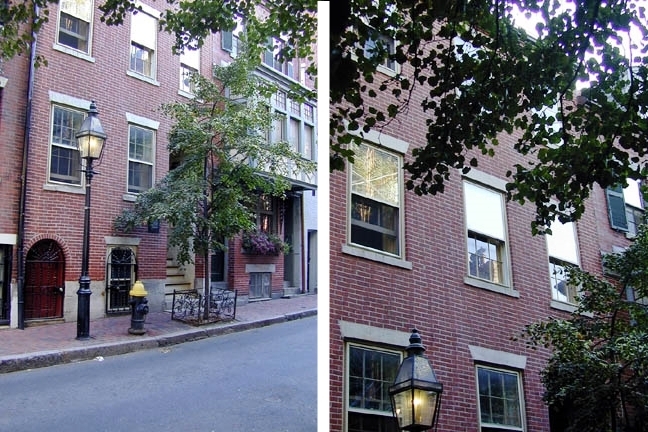 He ran a progressive school on Charles St. when he lived here. Tuition-paying parents pulled their kids out when Bronson admitted a black girl (Boston! ), he went broke, and was evicted from # 20 after about 2 1/2 years. You can check the New England Historic Geneological Society if you are interested, also the Boston City Directory. My friend and former house mate, Charlie sent me this link. I also lived in this house for about the same time as he did. I had the top,two,floors, the penthouse so to speak! There was a sign that the Alcotts had lived there and occasionally someone would knock and ask if they could see inside. 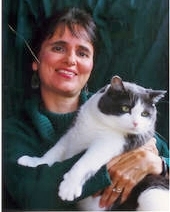 As I worked at a Boston teaching hospital, I worked with a doctor from Argentina. Anytime she had a friend visiting she would bring them over to see the house. I have so many fond memories of living there! Our Italian landlord Frank would try to sell the building to me but I was single and couldn,t imagine owning a house! I like your take on the house and am glad you enjoyed the photos. I’d love to go back. I wanted to take more pictures of her house in Concord but photos inside weren’t allowed. I know, I’d love to take photos inside Orchard House too! 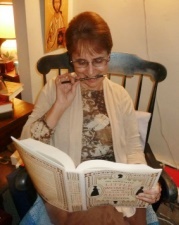 Next PostNext Help cast Margaret Fuller in a new movie!